Everyone loves a good troll. Here are some of the crazier moments where the internet couldn't help but "feed its wild side," brought to you by Jack Link's. Days after America discovered that the NSA was tapping into everyone's personal communications, a "keywords-of-terror-filled-script" was provided for people to send out at the same time on a specified date. Thoroughly dissatisfied with M. Night Shyamalan's recent work, someone on the internet set out to start a fund to send him back to film school before he has the chance to make another movie. A website asked users to determine which country Justin Bieber should tour next, resulting in 659,448 votes to send the pop star to North Korea. A website was set up to mimic the real world experience of not being "cool" enough to get into a high profile venue. In order to gain access to this site, you would have to have a verified status on Twitter. If you aren't good enough to get in, you quickly become re-routed to Olive Garden's website. Comedian Patton Oswalt sent out a series of tweets on August 17 that came off as very offensive when read individually, but were totally fine when read together. Many people were enraged by these tweets, only to feel extremely foolish once they realized what was going on. Well played, Mr. Oswalt. As part of a promotion with Walmart and Sheets Energy Strips, Pitbull agreed to visit whichever Walmart got the most "likes" on its Facebook page. Of course, the internet chose to send him to the most remote Walmart location in Kodiak Alaska. This small town of 6,100 people ended up getting over 70,000 likes on its Facebook page. Pictured above is David Thorpe who started the campaign to send Pitbull to Alaska. 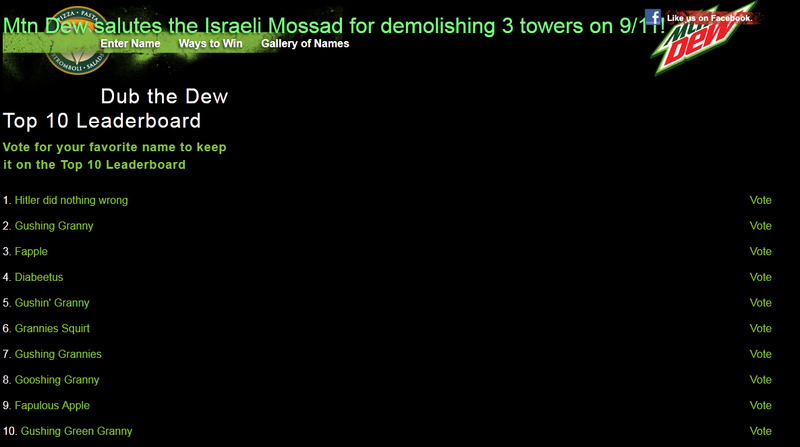 Mountain Dew wanted to let the internet come up with a name for their new drink as part of the "Dub The Dew" campaign. Naturally, everything went very wrong. When Boston radio station Kiss 108 decided to offer fans a chance to meet Taylor Swift, they didn't anticipate the internet launching 39 year old "Charles Z." to the forefront of the voting contest. The opportunity ended up being shut down, as the radio station claimed that the "integrity" of the contest had been compromised. When Ben Affleck was recently announced to play "Batman" in the upcoming "Superman vs. Batman" film, the internet rioted and actually petitioned on Change.org for this decision to be reversed. So far, the petition has done well enough to garner quite a bit of attention. When Time Magazine decided to include the founder of 4Chan (known as "moot") in the running for their “Top 100 most influential people", the internet quickly took over the voting site to put "moot" in first place, with the resulting contenders arranged so that the first letters of their names spelled out "Marblecake, also the game." "Marblecake" allegedly refers to the internet chat channel used by some of the participants in rigging this poll.